In August of 1981 I married Richard Theilmann, then of North Port NY, which began a trip down the rabbit hole that impacted my, and my son's life for years afterward . That trip included such events as : his arrest for lewd and lascivious acts in front of a minor, bankruptcy, foreclosure, IRS fraud and any number of other lies and infractions of the law, major and minor. The thing is , somebody, some friend or family member had to have know just how dangerous this guy was but no one, warned me. Anyone who lived with him or knew him for more then a year had to know that for him lies were easier than the truth. At one point, years ago, Richard remarried. He told me that his wife was aware of his " problems" and that being in therapy was a condition of his staying married to her. It seemed he was trying to get his life on track and I wished him well. This week I stumbled onto his My Space page . It was disturbing. He is no longer married. He is out there trolling for women. It is no longer 1981, and now there is the internet. I will use this blog to tell my story. My message is this : Be careful, be very careful, this guy is toxic. In May when I started this blog it was hard to find a reference to Richard on the Internet, he has kept , up till now a low profile. Today, well there are pages on pages of links to Richard Theilmann. He has added to his repertoire : Space Aliens, posing as a Naval officer and aviator, theft of valor , surgical alterations ( so he can communicate with the Alf's ). He has spun a web of intricate fabrications , impressive even for him. I called him this morning and asked him to tell me the truth. Tell me what is going on Richard , I said, how did this all get started. I asked him where the spanking photo came from, even though I knew it was from his My Space page. He swore, swore, yes he swore, he just didn't know. The photos of him, decked out like a war hero. They came from some video company. 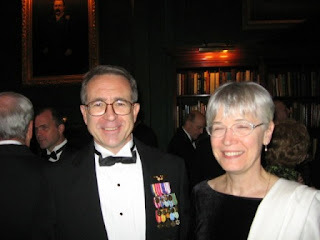 Oh okay, that is explained then.Google Richard today and on can easily find a photo of he and is Mary at a Naval Order of the United States, New York Commandery dinner decked out in medals that he has no right to wear. They include the Bronze Star and Purple Heart. Richard never had and never will serve in the Navy or any other branch of the armed services. The caption reads LCDR Richard Theilman (Lieutenant commander ). When asked if He and Mary were still married , the answer from Richard was yes. Public record shows the answer no. What is the source of the "War Hero" photo? Richard says , video company, what ever that means. I wanted to put a warning out on the net. Richard is busy putting up his own.